Slotted overflow for deep soaking. VibrAcoustic® technology emits sound waves and offers a surround sound experience. Six transducers and a control amplifier with 25' (7.6 m) of wiring. High-resolution color screen in polished chrome. The Memoirs 5 ft. whirlpool features classic, architectural styling while its innovative technology creates a sensory sanctuary where you can relax, rejuvenate and renew. A variable-speed pump with 18 settings powers six Flexjet whirlpool jets that provide an individually adjustable hydro-massage for those aching muscles, and an in-line, 1.5-kW heater keeps the water at your desired temperature. This KOHLER<sup></sup> Experience whirlpool integrates with the Memoirs Suite to create unified style in your bath or powder room. This model offers a three-wall alcove installation and a drain outlet on the left-hand side. Also available in store by special order only see store for details. 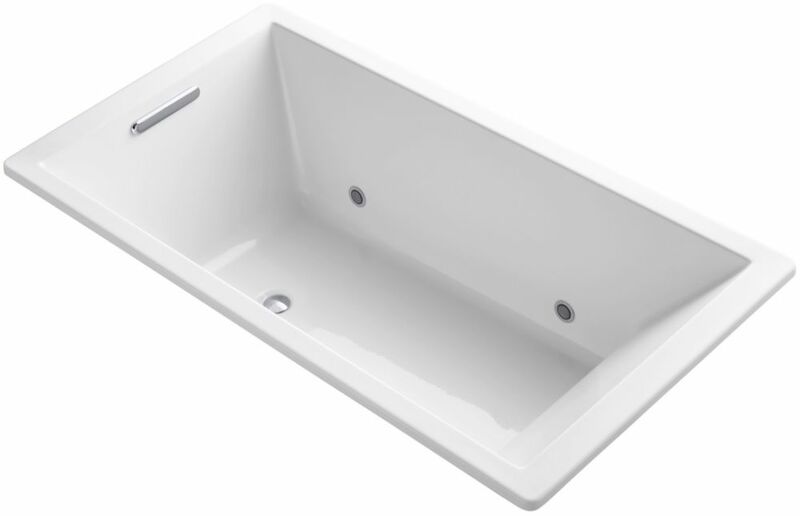 Underscore 5.5 ft. Vibracoustic Reversible Drain Bathtub In White Relax your body, calm your mind, and lift your spirits in a luxurious bath of water and sound. KOHLER's VibrAcoustic technology brings personalized hydrotherapy to this sleek Underscore bath, for a sensual experience unlike any other. Hidden speakers emit sound waves that envelop and gently resound within the body. Choose a soothing spa session with built-in compositions, unwind to your own music playlists, or catch up on news and podcasts. Chromatherapy lights, with a sequence of eight colors, accompany the acoustics for the ultimate relaxation experience. Whether you want a profoundly relaxing bathing session or an entertainment stereo system for your bathroom, Underscore VibrAcoustic has versatile options to realize your vision.